In this FAQ you can find many tips, tricks and explanations about circuit- bending. Here you find pictures and info about my collection of more or less circuit- bent instruments, their most interesting features, what I found out about their hardware and which eastereggs I discovered. Also instruments constructed by me are here. This page lists my collection and general info about music cartridges and other original software media for electronic musical instruments. Here is a list of keyboards I want to buy and accessories I am still looking for. Here are some hyperlinks to other sites about electronic keyboards, synthesizers, sound toys and circuit- bending. Some keyboards removed from my wanted page, because I finally got the ultra-rare MC-55 (FM, similar like GPM MC5000) and Bontempi BS2000 & BS3000 (both strongly resemble BS2010 & KE3860 with same flaws). Sorry, no updates yet. I am finally online again on my own webspace. This is only a partial update, thus there may be currently some missing photos and dead links to some pages those are not finished yet. I also have updated the FAQ. Casio SK-5 added. Finally a huge new site update has been finished. It contains plenty of new Casio keyboards (including the Super Drums keyboards Casio MT-52, MT-500, MT-520, the Casio PT-50, the squarewave synthesizer Hohner KS 49 midi (Casio HT-700) and the mythical keyboard boombox Casio KX-101 with detailed hardware photos), and I added a big bunch of bizarre new Yongmei tablehooters (with Yongmei YM-2100, DL-2300, YM-3300, YM-6700, MS-110A, MS-210B, Miles MLS-4900A), great My Music Center successors (MIDI synthesizer Elta KE-491, Potex - Super Jam, Yongmei YM-2100) and the great hand gesture controlled toy groovebox Beat Square - AIR-Dance Mixer. Also many new hardware photos, tech infos and corrected Casio chip comparisons have been added and a list of keyboard software media, a wanted- page and a major update of the FAQ. Major FAQ update and tons of new instruments added - including Casiotone 401 (first Casio with rhythm), Casio CZ-230S, Casio MT-85, Casio CT-840, First Austria MC-36 (= Casio MA-150/ MA-170), Bontempi GT 770, obscure Amstrad Fidelity CKX100, circuit bent Casio MT-540 (detailed instructions), extremely bent Simba 683 3149 (incredible tekkno effects & POKEY sounds) and 2 great modified Potex toy DJ consoles (Beat Square - Mix Evolution, Kid's Com - Mix Me DJ). Various upgrade schematics added (e.g. Yamaha SHS-10, Casio CT-410V). Jörgensen Clavioline (great monophonic tube synth keyboard) added, as well as modified Sankai 01870K, Golden Camel 11AB, Kawasaki Pro 37, Bestar MC 3800, GPM MC-5000, Penrod AJ-430, Kawai PH50 (great movie effect sounds) etc. Links page updated (e.g. Yongmei homepage, Clavioline.com, piano history). Various keyboards added, including Casio SA-65, SA-2 and the great SK-60 sampler, MusicZone Keyboard, SongMax HMP-138, Bontempi GT 759. So far not mentioned otherwise, all contents of this website is copyrighted by CYBERYOGI =CO=Windler and must not be used commercially without my explicit written permission. If you wish to publish parts of it elsewhere, e-mail me. Pictures those are marked as taken from the internet are used here for educational purpose only. 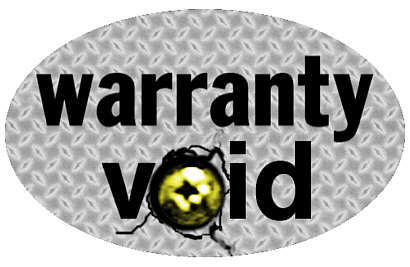 This site is not affiliated with the "Warranty Void" PC overclocking site. All shown brand names and logos of musical instrument manufacturers etc. are property of their owners; they are not affiliated with this site. You can not place ads on my website.